In times of famine or drought, AFCA provides nutritional support in the form of fortified porridge to children in our programs. 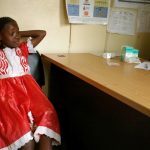 Because some of the medications the children are prescribed must be taken daily, it is imperative that they don’t stop taking it, even if food is scarce. Therefore, in times of drought or famine, a program called Nutrition by Prescription comes into play, making sure that affected children in our programs have the food they need during this time of emergency.